Story time: For some reason, I got it into my head that I should make latkes. But not normal ones, multi-vegetable latkes and then sweet potato latkes. Then I added bringing a friend to help me eat the latkes. 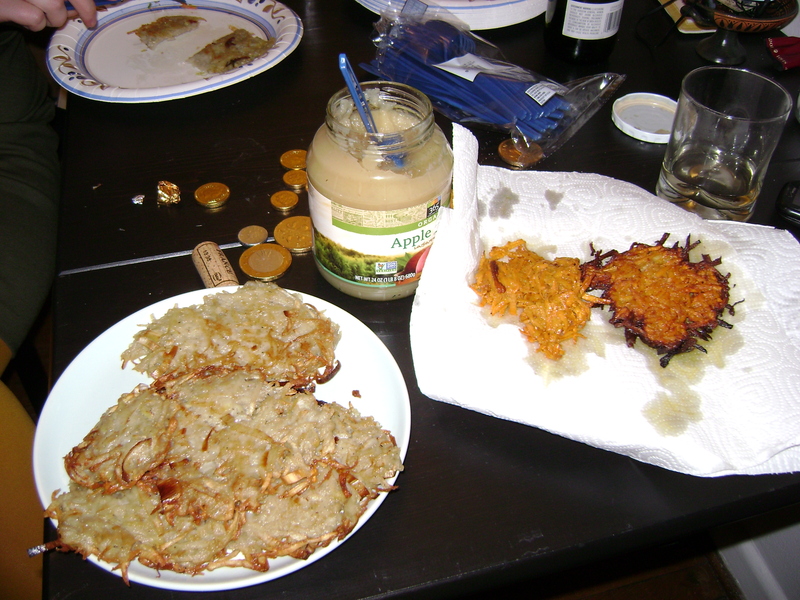 After that, I added normal latkes because what if the other ones were bad – I can’t serve my friend untested recipes. This all ended with the inevitable and totally awesome concept of “lets invite some of my other friends and have a party!” And thus, an awesome latke party was born. 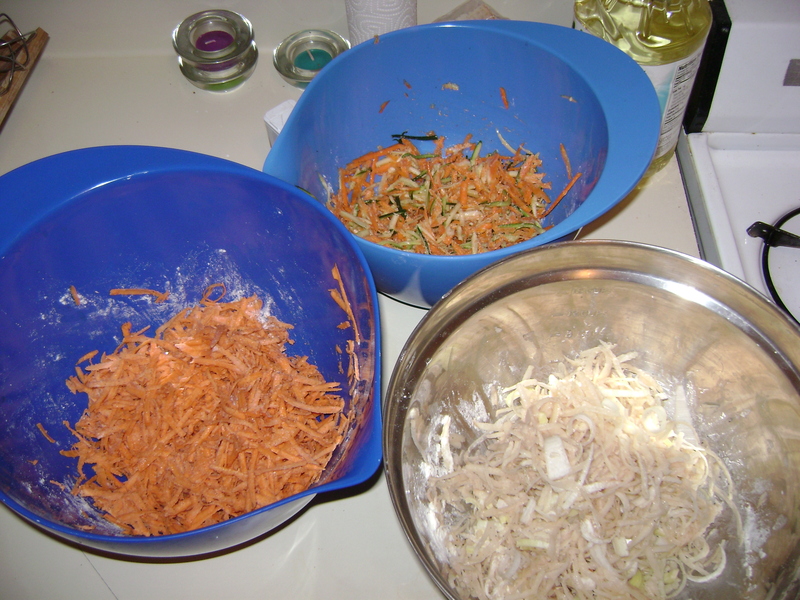 My friends, tunes, wine, and three completely untested recipes – two of which I was making up as I went. Normal latkes: This recipe was adapted from Fanny Farmers cookbook – a ridiculously old-school Americana cookbook that is amazing. It has everything. Peel and shred two Russet potatoes. Add 1 medium leek, thinly sliced, salt, pepper, and 2 tablespoons of flour. Beat one egg and add it to the mixture. Heat vegetable oil in a frying pan. Pu about 1/3 cup of the potato mixture into the frying pan and pat into a pancake. Fry, and stick onto paper towels. 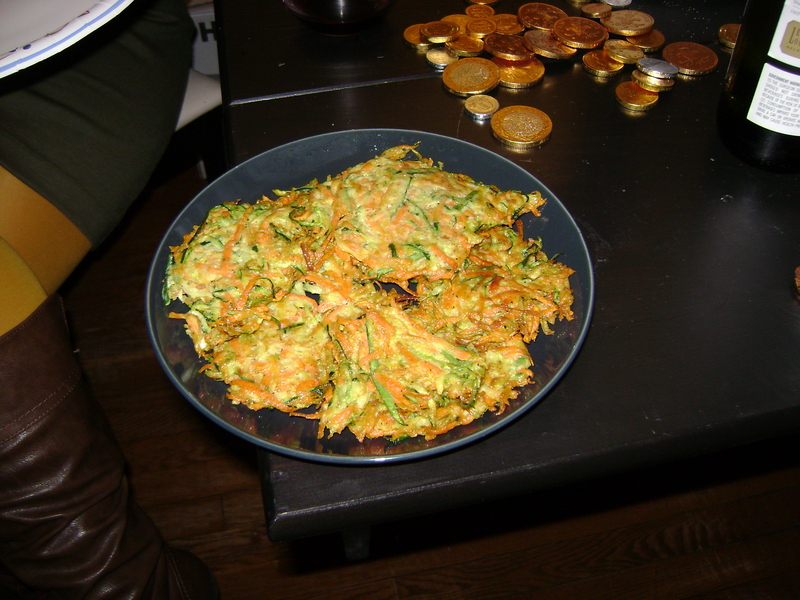 Veggie one: I mentioned that I wanted to make veggie latkes to one of my friends who is also a vegetarian, and she suggested carrot and zucchini. It was a good suggestion. Shred 2 medium zucchini and 2 large carrots, add 1 1/2 tsp of cumin (or really to taste), 2 tablespoons of flour, salt, and a beaten egg. Fry. Sweet potato: Same basic recipe as the other ones, just with one large sweet potato and 1 1/2 tsp nutmeg. The result – all of them were delicious. Well – that was the general consensus, and all of them were eaten, but it was a party. Lots of red wine (rioja, malbec, and beaujolais) was also consumed so no promises. While food processors make shedding veggies easier, especially in large quantities, you can totally do it just with a standard hand-grater. I also learned that frying things in multiple pans with bare feet is not really the best life choice. Latkes can be served with applesauce, sour cream, or, if you want to be ridiculously American, ketchup. Finally, song obsession of the week: an acapella version of Jai Ho.